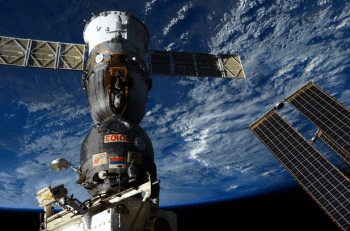 NASA’s Terry Virts, Samantha Cristoforetti of ESA and Anton Shkaplerov of Roscosmos have returned home on their Soyuz TMA-15M spacecraft following undocking from the International Space Station on Thursday. After what proved to be a smooth entry, their extended mission finally came to a conclusion when their Soyuz safely touched down under parachutes on the steppe of Kazakhstan. The trio arrived at the orbital outpost last November for what was supposed to be a six month tour. Due to the unexpected failure of the Progress M-27M spacecraft, Roscosmos decided to delay the return of TMA-15M, providing a number of extra weeks on Station for the crewmates. The extension allowed for Cristoforetti to set a new duration record for a single mission, beating NASA astronaut Sunita Williams’ 195 days that was set in 2007. Upon landing, Virts – who also helped set the ISS up for future commercial crew vehicles during his EVAs – logged 212 days in space on two flights, the first of which was on space shuttle mission STS-130 in 2010. Shkaplerov spent 364 days in space on two flights, the first of which was on Expedition 29/30 in 2011. The Station provided the trio with some additional excitement prior to their farewells, with a Pre-Determined Debris Avoidance Maneuver (PDAM) conducted at the start of the week, as the Station dodged a spent Minotaur rocket body. The Soyuz itself also showed its eagerness to return back to Earth via an unexpected engine firing, much to the annoyance of its host. The incident occurred during the routine testing of communications systems between the Soyuz TMA-15M spacecraft and the Station, with the Soyuz thrusters inadvertently firing, leading to a slight change in the orientation of the ISS. 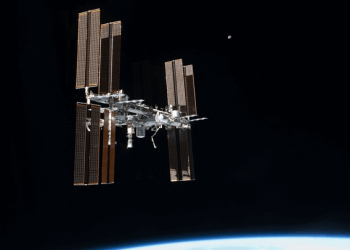 “Large Torque Noted on ISS: The ISS experienced unexplained torque in the roll axis. ISS was in Control Moment Gyro (CMG) Momentum Management at the time. A total of 48 CMG desaturation firings were observed prior to Port and Starboard SARJ being safed in the Loss of Attitude Control (LoAC) position,” noted ISS status information in L2. “After safing the solar arrays, there were four more desaturations. LoAC was declared due to reaching the 10deg/axis attitude error threshold, and ISS was allowed to auto handover to Russian thruster control. ISS then maneuvered back to the nominal attitude on Russian thrusters. Although the incident sounds dramatic, former ISS commander Chris Hadfield took to Twitter to note such unexpected firings can take place in this manner. The first order of business for the return of this latest homeward bound crew was conducted on Wednesday when Expedition 43 Commander Virts handed over command of the space station to cosmonaut Gennady Padalka of Roscosmos. In preparation for the trip home, the Soyuz TMA-15M crew donned their Sokol launch and entry suits, closed the hatch between the Orbital Module (BO) and Descent Module (SA), and strapped themselves into their Kazbek couches inside the SA. Following undocking, that occurred at 10:20 GMT, the Soyuz enjoyed a few hours of free flight as it departed from the Station’s neighborhood via two separation burns, as the crew completed the final leg of their 84 million mile journey. 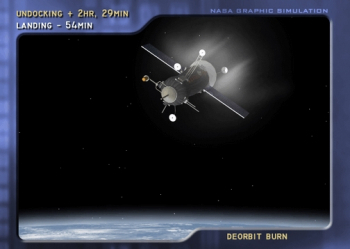 The deorbit burn was the next key milestone of the return leg, completed around one hour ahead of landing at 12:51 pm GMT. The timing of touchdown, under soft thruster engine firing, was dependent on a number of factors and was officially marked at 13:44 GMT. The crew transferred almost immediately on to special chairs, where medical checks were conducted, ahead of being moved to a medical tent by all terrain vehicles to prepare them for transit. 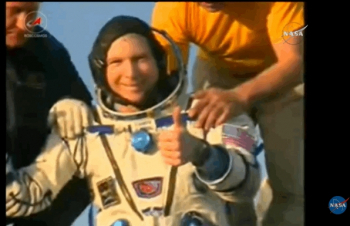 All three crewmembers appeared to be relaxed and in excellent health. Shkaplerov was flown back to Star City, while Virts and Cristoforetti boarded a NASA Gulfstream III aircraft and flown back to Ellington Field in Houston, Texas – via two refuelling stops in Glasgow, Scotland, and Goose Bay, Canada. Back in space, Expedition 44, under the command of Padalka, will continue as a three member crew alongside Scott Kelly of NASA and Mikhail Kornienko of Roscosmos. They will be joined by NASA astronaut Kjell Lindgren, Russian cosmonaut Oleg Kononenko and Kimiya Yui of JAXA when they launch from Kazakhstan in July. Kelly and Kornienko are a third the way through their one year mission into researching medical, psychological and biomedical challenges faced by astronauts during long duration spaceflight.